I am very pleased to announce that we have rescheduled our book launch celebration! We are hoping that you will be able to join us on June 26th from 6:00 - 8:00 PM, at Stephen-Bradford Search: 261 Madison Avenue, 11th Floor. Roger Matloff, Joy Chaillou, and the team at Stephen-Bradford Search are looking forward to sharing a few insights, answering any questions, and above all having this opportunity to celebrate with our friends and colleagues. 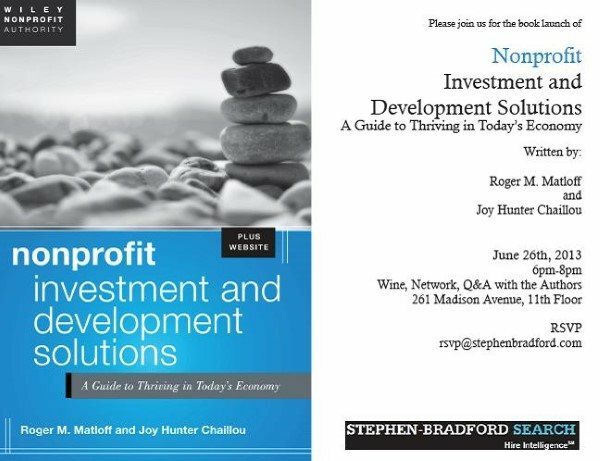 We will also be providing some insight for those outside of the nonprofit development world that are interested in bringing their skills to a career in nonprofit fundraising. Please see the details on the flyer below, and RSVP directly to our host, Elyse Barbell, at Stephen-Bradford Search by emailing rsvp@stephenbradford.com.